Due to the downturn in the economy there appears to be more empty shops and parking lots than every before. On Atlantic Blvd. where several car dealerships used to do a thriving business "For Sale" signs beckon to potential real estate buyers while locked gates keep vandals out. I often drive down the street singing that song about paving paradise and putting up another parking lot. Black top everywhere and not a tree in sight. I think to myself (and others who will listen) why not tear up the asphalt, bring in some fill dirt, and turn everything green again. If they can pave it, can't they unpave it? I was really excited when I read an article in today's paper * that someone else had the same idea. Several someone's in fact. Great minds do, indeed, think alike. 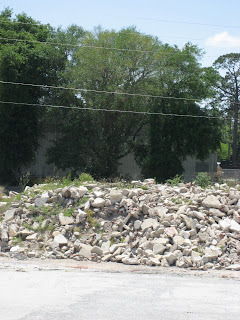 Again because of the poor economy, the man who owns the property that used to house a Chevy dealership on a prominent road, decided to do some beautification work until he could build condos and retail stores that would actually make money. Last year he threw out some wildflower seeds. Mother Nature did the rest. As often happens when you mix sunshine, rain, and a little ingenuity more grew than just some flowers along the side of the road. People driving by began to notice the unexpected beauty. One thing led to another and soon what was once a parking lot became a garden. I decided I had to see this for myself. I drove down the street known for after hour activities. I saw concrete tarmac surrounded by a chain link fence, orange and yellow and purple wildflowers swaying in the slight breeze and, way across the parking lot from me, something green. Glorious, green. I immediately wanted to get closer. I could see a car and a person but I couldn't figure how to get inside the locked gate. It took me a couple passes before I realized the chain was not actually locked. I parked my car, grabbed my camera and made my way to a little pocket of Eden, right in the middle of concrete and rocks. I looked around. I took some pictures. All the while making my way towards the car as if being led by the Great Gardener in the Sky. I wanted to meet the farmer. Hello said the woman with dirt on cheeks and a smile as welcoming as the sandlot perennials. Right there in a place I'd never been before I peered into the face of someone I knew - or thought I knew. Serendipity? Small world? It turns out I knew her sister and they look very much alike. With introductions out of the way, I began to gush about the whole garden project with tears in my eyes and perhaps more enthusiasm than the situation called for. But I was so moved by the idea, the beauty, the bounty, and the smell. How is it that aroma of dill, onions and dirt can blend together to make such a clean, fresh smell? 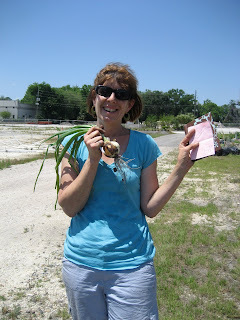 I think if Mother Nature ever needs a person to talk up the merits of gardening, Lisa Wright is the woman for the job. By her own admission Lisa knows indoor plants but this is her first experience at asphalt gardening. Her excitement and enthusiasm for this project makes her the perfect spokesperson for the "Gardens at Jackson Square" on Facebook. She was glad to know I'd read the newspaper article and come to check things out. Hopefully there will be others. In the various plots I saw strawberries, herbs, tomatoes, onions and other things that I couldn't identify from the foliage. In the garden planted by the local homeless shelter, the corn is already about 18 inches high. I can't wait to go back in a few weeks to see how much progress has been made. Before I left, Lisa led me along a path through the the wildflowers. Like last week's adventure to the Treaty Oak, I let my mind wonder by life's possibilities. Who would ever guess that a giant oak tree could grow from a tiny acorn no bigger than the end of my finger? And who would believe that a handful of seeds could turn a concrete jungle into a small piece of Paradise? Sweetie and I have been discussing tearing up a small patch of the back yard and planting a small garden. After today, I'm ready to get started. Sweetie will get out the ruler and graph paper. I'll buy the seeds and maybe a nice hat to keep the sun off my face. Sweet will work up a sweat nailing together a small square to fill with Miracle Gro and I'll make pretty little signs that tells what is growing where. Sweetie will check the plants' progress every morning before anyone else is up. Dad will supervise from the patio and I will sing to my little sprouts. OH! this makes me smile! And I can here you singing soft and sweet! So my heart is singing now, which really as close to any singing I do anybody would want to get! What a good idea lets hope it catches on. This really makes my heart sing...I can no longer do the garden plot but I can still do container gardening and it brings such joy when you can eat from what you've sown. Happy Gardening To You and May It Be Fruitful! WOO HOO!!! No need for coffee today, Mary! Thanks for making my spirit soar! Off to share John Denver with all my buddies! "Man is made of dreams and bones..."